But what has she done for me lately? 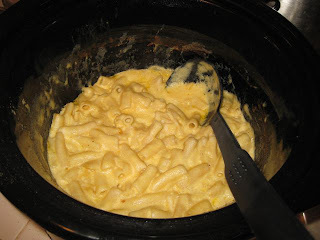 Well, luckily, she has a quick and easy CrockPot mac and cheese recipe, which (bonus!) does not involve pre-boiling the pasta. Why is this important? You tell me – I mean, would you buy a CrockPot imagining perfect one-pot meals, only to have to use up other pots and pans to prepare the ingredients to go into your CrockPot? It’s throw and go – right? Stephanie feels the same way, and thus – the no-boil mac and cheese recipe! Recipe below cut and paste from the website: A Year of Slow Cooking. Cover and cook on low for 2-5 hours, or on high for 1-3. 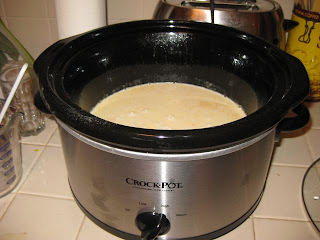 The cooking time will vary depending on what size crockpot you are using, and how quickly it heats and cooks. So, how did it go? As stated, I’m a CrockPot novice, therefore I checked in on this dish about every ½ hour (especially as some of the comments to the recipe stated there had been “curdling,” a word that makes my blood, well…curdle) so it wasn’t the ideal “set it and forget it” kind of dish I was hoping for in my CrockPot fantasies. Truth be told, after about two hours the pasta was on the far side of done but there was still a lot of liquid, so I quickly boiled up another ½ cup of pasta and threw it in the pot to help absorb the sauce (so much for my “no-boil” plan). Unfortunately, the damage was done and the noodles had lost their firmness – which seems to be a common challenge with cooking pasta in the CrockPot. I think that definitely hurt the overall effect. But in the end – I got a creamy cheesy pot of somewhat overcooked but deliciously rich mac and cheese, and frankly, I felt like it was success. The biggest downside was the lack of a crunchy crumb topping. It just doesn’t feel like true mac without it! Hilary Havarti agreed, and also mentioned that reheating didn’t do this mac or its sauce any favors. Mr. Humboldt Fog seemed to think it improved upon reheating, but hated that there was no topping. Definitely one of the more controversial mac dishes I’ve made. The upshot? Although there are better mac and cheese recipes around, if you need to take something to a potluck, or, you know - the Junior League or church social – you could do a lot worse.